If GBS has occurred within 6 weeks of previous influenza vaccination, the decision to give Influenza A (H1N1) 2009 Monovalent Vaccine should be based on careful consideration of the potential benefits and risks. CSL’s Influenza A (H1N1) 2009 Monovalent Vaccine and seasonal trivalent Influenza Virus Vaccine (AFLURIA) are manufactured by the same process. The following sections summarize data obtained from clinical studies and postmarketing experience with AFLURIA. Serious allergic reactions, including anaphylactic shock, have been observed during postmarketing surveillance in individuals receiving AFLURIA. The most common local (injection-site) adverse reactions observed in clinical studies with AFLURIA were tenderness, pain, redness, and swelling. The most common systemic adverse reactions observed were headache, malaise, and muscle aches. Clinical safety data for AFLURIA have been obtained in two clinical studies (see Clinical Studies ). A US study (Study 1) included 1,357 subjects for safety analysis, ages 18 to less than 65 years, randomized to receive AFLURIA (1,089 subjects) or placebo (268 subjects). There were no deaths or serious adverse events reported in this study. A UK study (Study 2) included 275 subjects, ages 65 years and older, randomized to receive preservative-free AFLURIA (206 subjects) or a European-licensed trivalent inactivated influenza vaccine as an active control (69 subjects). There were no deaths or serious adverse events reported in this study. The safety assessment was identical for the two studies. Local (injection-site) and systemic adverse events were solicited by completion of a symptom diary card for 5 days post-vaccination (Table 1). 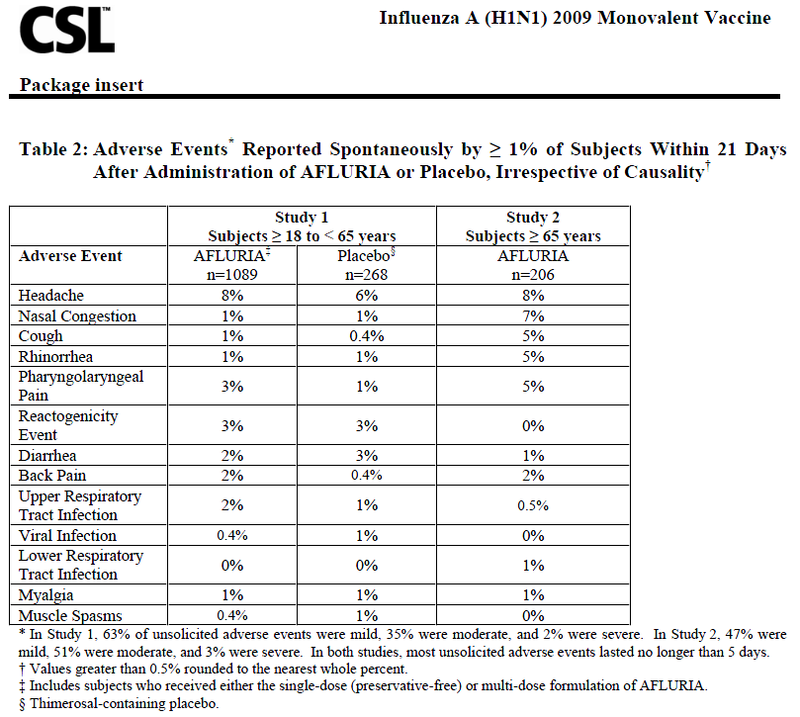 Unsolicited local and systemic adverse events were collected for 21 days post-vaccination (Table 2). These unsolicited adverse events were reported either spontaneously or when subjects were questioned about any changes in their health post-vaccination. All adverse events are presented regardless of any treatment causality assigned by study investigators. Because postmarketing reporting of adverse reactions is voluntary and from a population of uncertain size, it is not always possible to reliably estimate their frequency or establish a causal relationship to vaccine exposure. 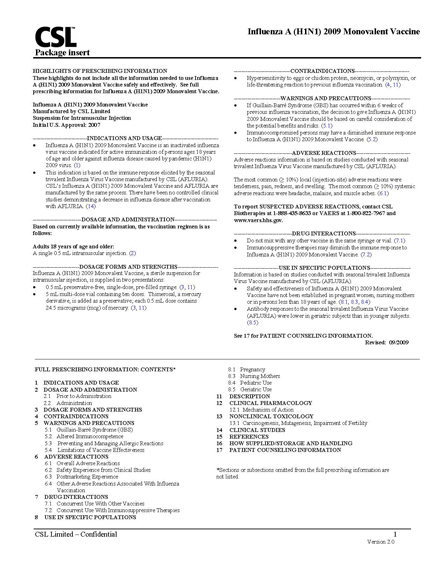 The adverse reactions described have been included in this section because they: 1) represent reactions that are known to occur following immunizations generally or influenza immunizations specifically; 2) are potentially serious; or 3) have been reported frequently. The following adverse reactions also include those identified during postapproval use of AFLURIA outside the US since 1985. Anaphylaxis has been reported after administration of AFLURIA. Although AFLURIA and Influenza A (H1N1) 2009 Monovalent Vaccine contain only a limited quantity of egg protein, this protein can induce immediate hypersensitivity reactions among persons who have severe egg allergy. Allergic reactions include hives, angioedema, allergic asthma, and systemic anaphylaxis (see Contraindications ). The 1976 swine influenza vaccine was associated with an increased frequency of Guillain-Barré Syndrome (GBS). Evidence for a causal relation of GBS with subsequent vaccines prepared from other influenza viruses is unclear. If influenza vaccine does pose a risk, it is probably slightly more than one additional case per 1 million persons vaccinated.